The Stanford Inn by the Sea~ A dream vacation spot! Most people go on vacation, gorge themselves on junk they don’t allow themselves to eat normally, and come home feeling full of regret and wearing clothes that are feeling a little tight. Ok, well maybe most people don’t do this on vacation, but I do! Anyway, I did until I found The Stanford Inn by the Sea. Staying there and eating their food you are filled with peace and nourished by healthy vegetarian or vegan food. 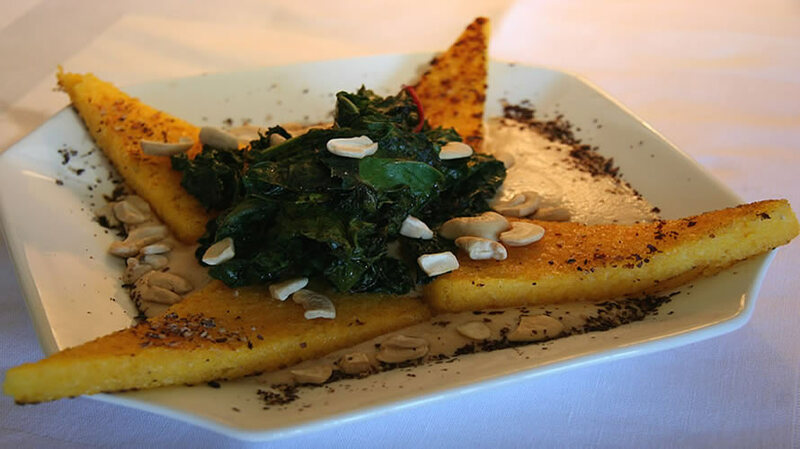 My favorite dish is the Citrus Polenta with Cashew Sauce topped with their homegrown garden greens. It’s divine! So if you’re looking for a place that fills you with beautiful surroundings and wonderful food then The Stanford Inn by the Sea is the place to stay. It’s locate in Mendocino, CA just a couple of hours north of San Francisco. “Nestled on a Mendocino Coast hillside, Stanford Inn, a Mendocino Resort, sits atop a meadowoverlooking Mendocino Bay. Embodying the best of the rugged Mendocino Coast, this Mendocino Resort is a haven … an exquisite opportunity to reconnect with nature. The rambling lobby, guest rooms and suites of this boutique hotel in Mendocino are paneled in pine and redwood. Every detail is attended to, from wood-burning fireplaces set and ready to light to the sumptuous chef-prepared organic breakfasts. Inspired by the Stanford’s Certified Organic gardens, The Ravens’ Restaurant, featured in Oprah Magazine, is outstanding and nationally acclaimed for vegan cuisine. Guests at Stanford Inn, as well as local Mendocino residents, consider Ravens’ Restaurant to be an essential dining experience on the Mendocino Coast. via Mendocino Hotels Mendocino Bed and Breakfast Inns Mendocino Green Lodging in Mendocino CA.